On September 11, 1857, some 120 men, women, and children from the Arkansas hills were murdered in the remote desert valley of Mountain Meadows, Utah. This notorious massacre was, in fact, a mass execution: having surrendered their weapons, the victims were bludgeoned to death or shot at point-blank range. The perpetrators were local Mormon militiamen whose motives have been fiercely debated for 150 years. In House of Mourning, Shannon A. Novak goes beyond the question of motive to the question of loss. Who were the victims at Mountain Meadows? How had they settled and raised their families in the American South, and why were they moving west once again? What were they hoping to find or make for themselves at the end of the trail? By integrating archival records and oral histories with the first analysis of skeletal remains from the massacre site, Novak offers a detailed and sensitive portrait of the victims as individuals, family members, cultural beings, and living bodies. The history of the massacre has often been treated as a morality tale whose chief purpose was to vilify (or to glorify) some collective body. Resisting this tendency to oversimplify the past, Novak explores Mountain Meadows as a busy and dangerous intersection of cultural and material forces in antebellum America. 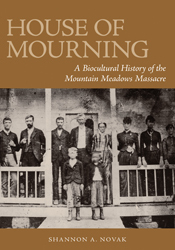 House of Mourning is a bold experiment in a new kind of history, the biocultural analysis of complex events. Winner of the Society for Historical Archaeology James Deetz Book Award. Shanon A. Novak is assistant professor of anthropology in the Maxwell School of Citizenship and Public Affairs at Syracuse University.